A device for cutting the pasta dough into pieces when making spaetzle. 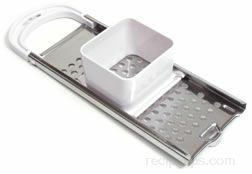 It is a flat, rectangle shaped device, resembling a hand grater that contains large holes and a square hopper with rounded corners on top. The device is placed across the top of a pot of boiling water and the hopper is filled with pasta dough. The hopper is moved back and forth across the plate with the holes and the dough is cut off into pieces that drop directly into the boiling water.